This is the time to show your true colors and gamble online at Casinoland. Browse an impressive collection of games belonging to various genres and discover the thrills of mobile gambling. 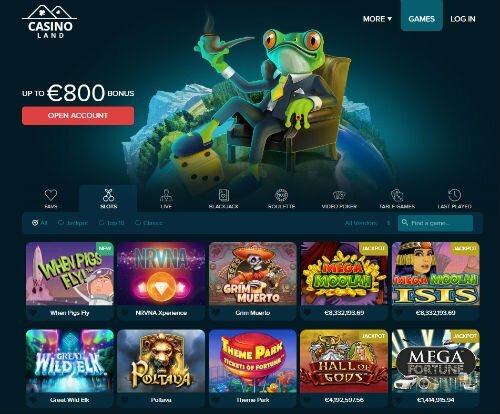 Discover the Pipe Smoking Frog Casino Casinoland is a new addition to the realm of online gambling, but has plenty of things to bring on the table. 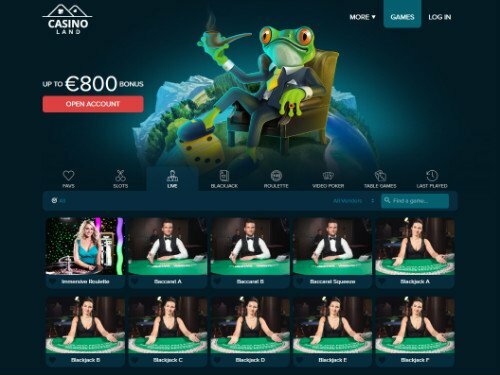 Instead of replicating the content of fellow casinos, it has built an original brand for itself and doesn’t hesitate to showcase it pretty much everywhere. When you land on the website, you will be greeted by a frog character that casually smokes a pipe. It’s not the kind of image that players expect to see when they open a real money account with an online casino. This is just the tip of the iceberg because there are plenty of other original concepts to greet real and virtual currency players. Feel free to explore all the games without spending a dime, but eventually you will have to make a real money deposit to take advantage of the Casinoland casino bonuses. Some of these offers are available with no strings attached, but others demand you to load your account. The odds are always stacked in your favor, so if you don’t find a promotion that appeals to you, don’t lose faith. Bonuses are added on a weekly basis and some of them are not mutually exclusive, so you can participate in several campaigns simultaneously. The casino is user-friendly and the website is translated in several languages, so check out if your language of choice is on the list. Navigation is a breeze and you won’t have any problem in finding a fancy game to play. This Casinoland review should put all your concerns to rest, if you are worried about how safe it is to gamble here. Firewalls are always up and ready to prevent unauthorized access and the 128 bit SSL encryption technology is also on guard. The fact that so far nobody managed to breach all these defensive lines speaks for itself. The software developers are Quickspin, Thunderkick, Evolution Gaming, ELK, Microgaming, NextGen Gaming and NetEnt. Their games are audited for fairness twice, once when they leave the production line and then again by independent companies. The bottom line is that Casinoland online casino creates the climate of safety and security that players require to enjoy their time here. You won’t be cutting down on security when shifting from desktop computers to mobile devices either, so don’t be afraid to gamble on the move. 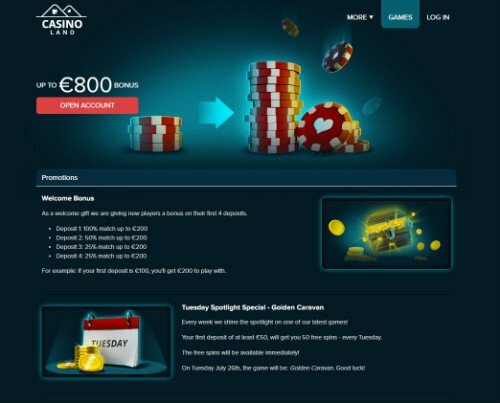 The Casinoland welcome bonus is divided in four installments, with the first four deposits being matched at a different rate. Newcomers will double their investment up to €200 when they make the first deposit while the second will be matched by 50%. The third and fourth deposits will result in a bonus worth 25% but in all these cases the upper limit consists of €200. The wagering requirements don’t change either, so bonus recipients would need to play the bonus amount 40 times before cashing out. Simple math reveals the fact that those who go the whole 9 yards and deposit $2200, will get to play with a combined amount of $3000. Clearing bonuses has never been difficult at Casinoland, especially for those who are hooked on video slots. These games have the best stake percentage contribution at 100%, followed by other slots who count for 75%. If you read the fine print, you will find out that table games and video pokers don’t count for clearing the bonus, so it’s better to steer clear from them. Players will have all the time in the world to explore the thrills of these genres after the introductory package has been redeemed. The same goes for deposits made via Skrill and Neteller, which are not accepted when players apply for bonuses. This is only one of the Casinoland promotions, with many more being available to those who already have an account here. Loyalty is rewarded by allowing players to move up the leaderboard and aspire for the VIP status. In the wake of new slots being introduced, the casino will offer free spins and bonuses to those who accept to focus exclusively on these titles. Casinoland bonuses and promotion are updated for the time of the review and may change. Players using Skrill or Neteller will be excluded from the welcome bonus. Casinoland games are a treat to the eye and regardless of how demanding players might be, they are guaranteed to find at least one game they enjoy. With so many flagship software developers joining forces to provide the best and the latest games, the collection grew fast in 2016. Players can browse an assortment of nearly 200 games, including some of the progressive jackpot slot machines. Their prizes are pooled across the entire network powered by the software developers, so they go up faster. Presentation is very important here, so when you join the casino, you won’t feel overwhelmed by all these titles. Large and tempting icons will make it virtually impossible to resist the temptation of clicking on these games. The casino chose to emphasize quality over quantity and that’s why only the best games make the ranks. Don’t be surprised to discover South Park, Eggomatic, Starburst, Tomb Raider, Thunderstruck and the Dark Knight in their lineup. Granted slot machines represent the vast majority of the games here, you won’t feel deprived of the thrills of playing video pokers. Casinoland has a healthy mix of classic games and innovative titles, including some that can’t be played anywhere else. In the live casino section, players are greeted by roulette, blackjack and baccarat games provided by Evolution gaming. When players compete against real dealers, they also get to enjoy the thrills previously reserved to those gambling in brick-and-mortar venues. Casinoland strongly believes that an online gambling operator is only as good as its mobile division. That’s why the collection of games compatible with smartphones and tablets grew exponentially over the last couple of months. By using HTML 5 technology, the casino presents its members with the option of gambling straight in the browser. Feel free to use Blackberry, Windows, Android and iOS powered devices to meet your gambling needs. No restrictions whatsoever apply to those who sign up for online promotions. You can gamble exclusively on mobile devices and still be eligible for any Casinoland no deposit bonus or any other freebies offered. Players can use smart phones to open an account, make a deposit, play and cash out their winnings just as they would on a desktop computer. Casinoland has a website that is so easy to navigate that players rarely need assistance. When pitch comes to shove and they need an expert to provide counseling, customer support is there to help them out. The specialists are fluent in English and can be reached 24/7 via telephone, email and live chat. The latter has emerged as the channel of communication preferred by most of those who gamble on mobile gadgets. Picking up the phone to ask for help is the conservative solution, but one that delivers the same reliable results. There are no toll-free numbers, but at least the waiting time when using the international phone number is short. Any questions that demand a more comprehensive answer would be better asked via email, with a response arriving in less than 24 hours. Casinoland might be a new player in a highly competitive industry, but it has plenty of arguments to aspire for a leading position. Its welcome bonus is one of the best out there and there are more than 100 table games where bonuses can be cleared. The gambling operator can still work on its collection of video pokers and table games, but this is something that comes in time. For the time being, those who are hooked on mobile gambling will find everything they seek here, regardless of their device of choice. We want to hear your opinion on Casinoland - Comment and let us know. - An impressive assortment of games powered by leading software developers. - Residents of several countries are denied access and don’t qualify for bonuses. - The emphasis at Casinoland is clearly on slots, with table games and video pokers falling behind. Interested in InterCasino Review? Play and Win!